Kamrup Metropolitan (Assamese: কামৰূপ মহানগৰ জিলা) is one of the 27 districts in Assam state in north-eastern India. 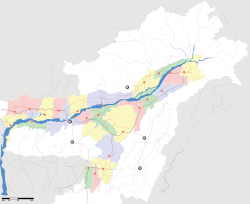 It was created on 3 February 2003 by bifurcating the erstwhile Kamrup district. Administrative headquarters of Kamrup Metropolitan district is at Guwahati city. The district occupies an area of 1527.84 km². According to the 2011 census Kamrup Metropolitan district has a population of 1,260,419, roughly equal to the nation of Estonia or the US state of New Hampshire. This gives it a ranking of 384th in India (out of a total of 640]eracy in India|literacy rate of 88.66%. ^ "Home page". Kamrup Metropolitan district website. http://kamrupmetro.nic.in/main.asp. Retrieved 19 March 2010. ^ "Historical Weather for Delhi, India". Weather Underground. http://www.wunderground.com/NORMS/DisplayIntlNORMS.asp?CityCode=42182&Units=both. Retrieved November 27, 2008. ^ a b "District Census 2011". Census2011.co.in. 2011. http://www.census2011.co.in/district.php. Retrieved 2011-09-30. ^ US Directorate of Intelligence. "Country Comparison:Population". https://www.cia.gov/library/publications/the-world-factbook/rankorder/2119rank.html. Retrieved 2011-10-01. "Estonia 1,282,963 July 2011 est." This page uses content from the English language Wikipedia. The original content was at Kamrup Metropolitan district. The list of authors can be seen in the page history. As with this Familypedia wiki, the content of Wikipedia is available under the Creative Commons License.